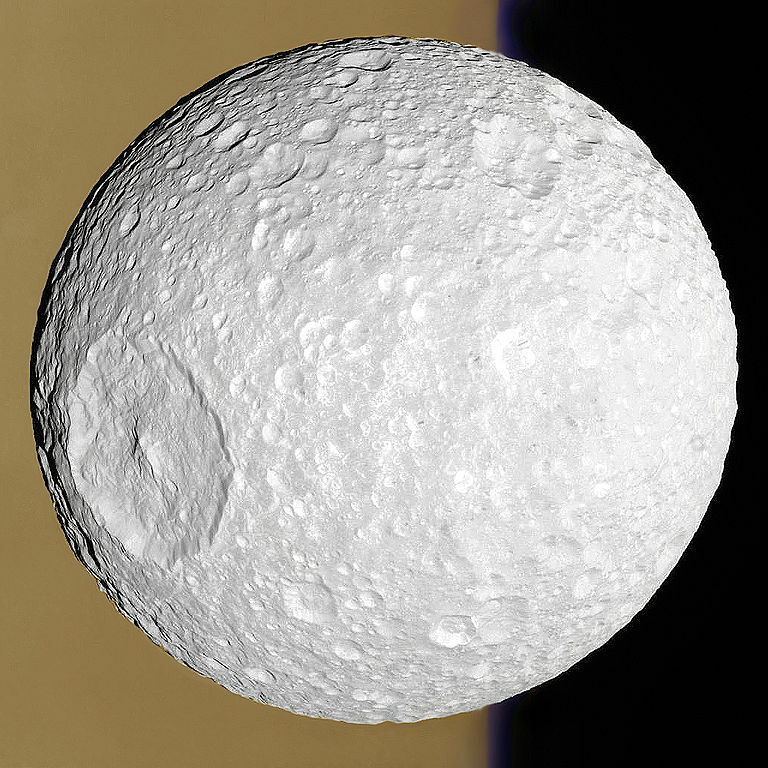 Discovered in 1789 by William Herschel, Mimas has a diameter of 396 km making it the 21st largest moon in the solar system! 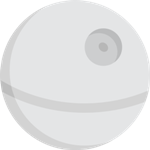 It is also the smallest astronomical body in the solar system to be naturally rounded by gravity; all smaller moons are irregular in shape. 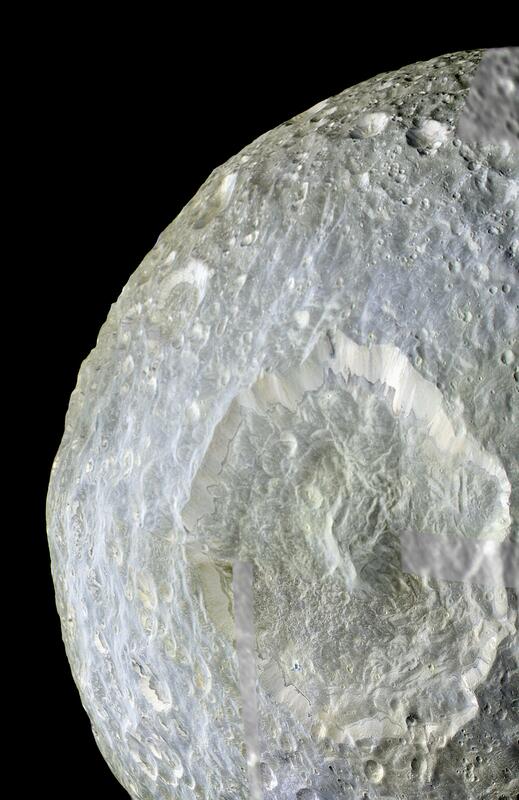 Mimas is most famous for its relatively large Herschel Crater, which makes the moon resemble the Star Wars space station – the Death Star! 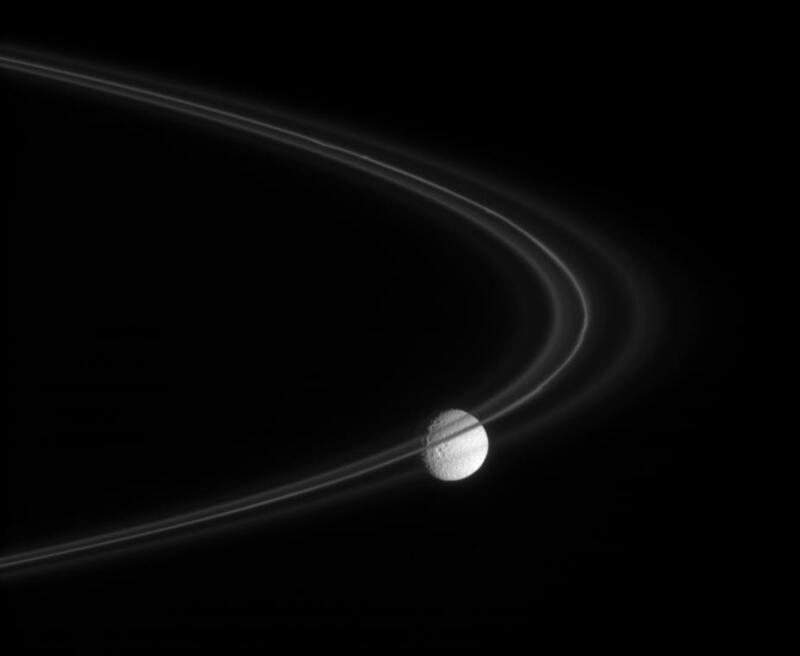 Fast Summary Facts About Mimas! 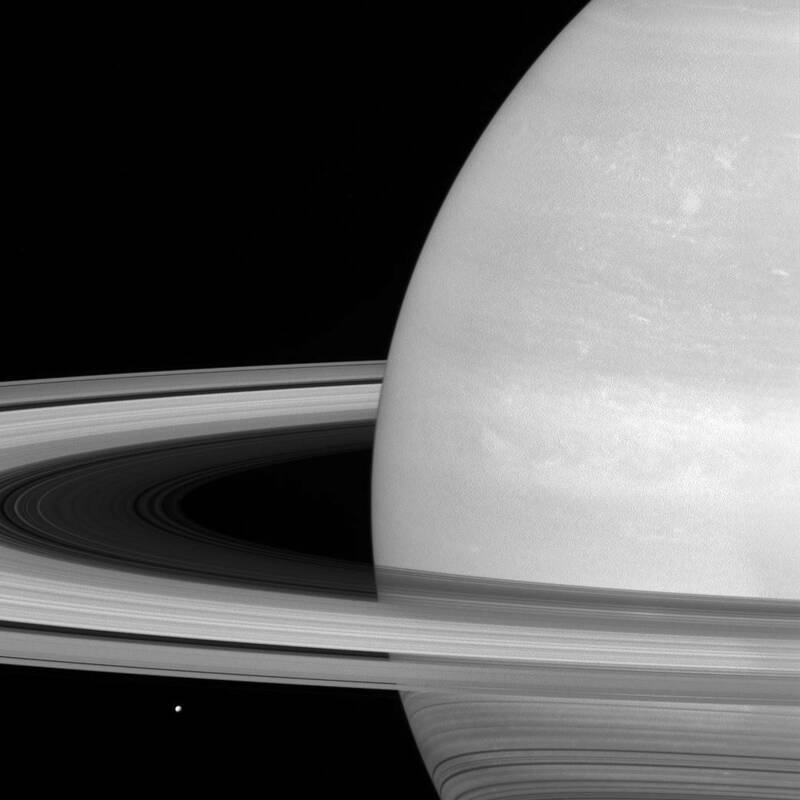 More Fun Facts About Saturn’s Death Star! 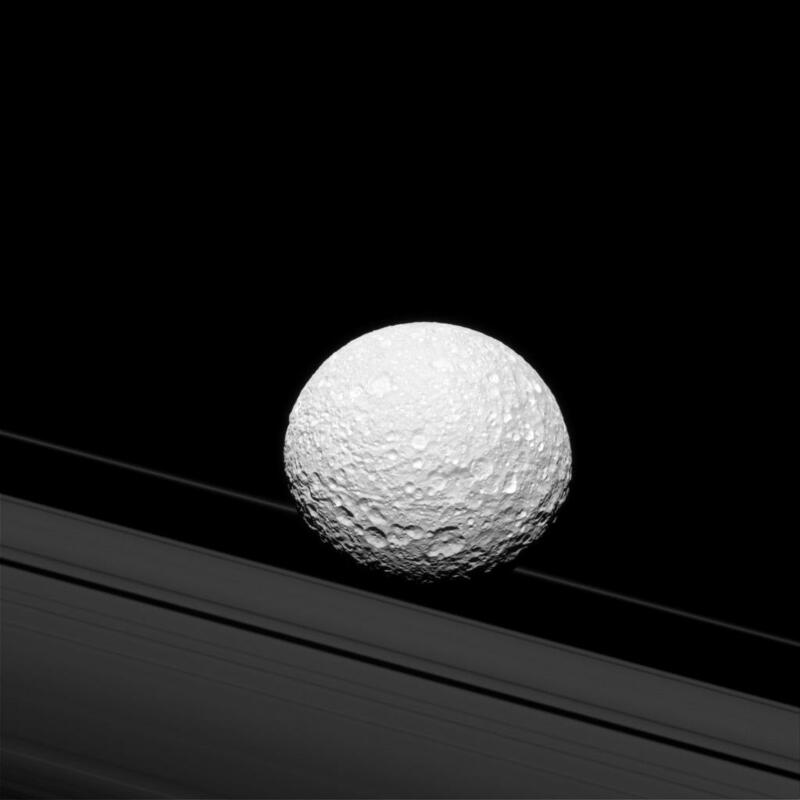 Despite the moon being discovered in 1789, it wasn’t until 1847 that the name Mimas was given to it to avoid confusion after additional moons around Saturn were discovered. 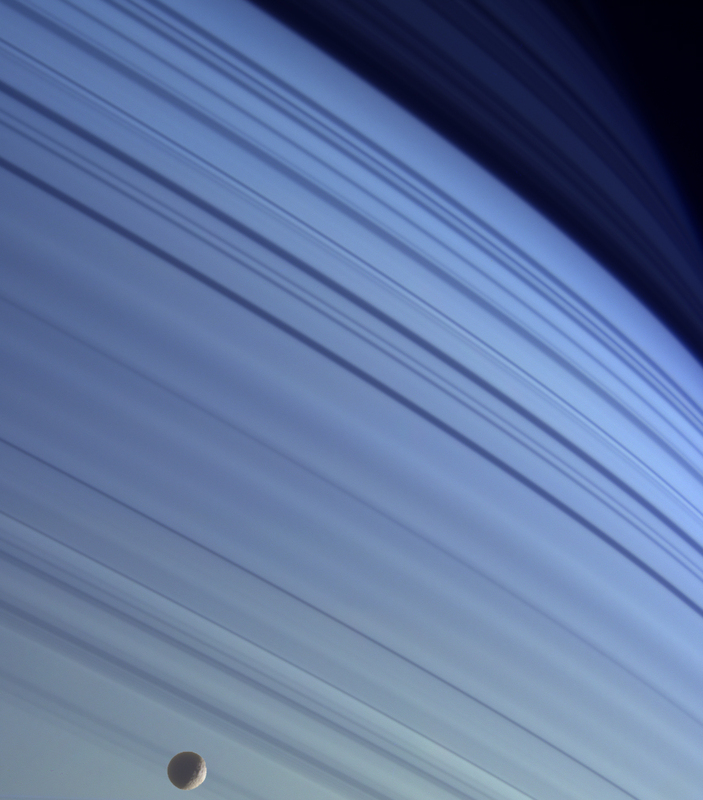 Some astronomers refer to the moon as Saturn I (being the closest major moon to Saturn) as it was initially known. 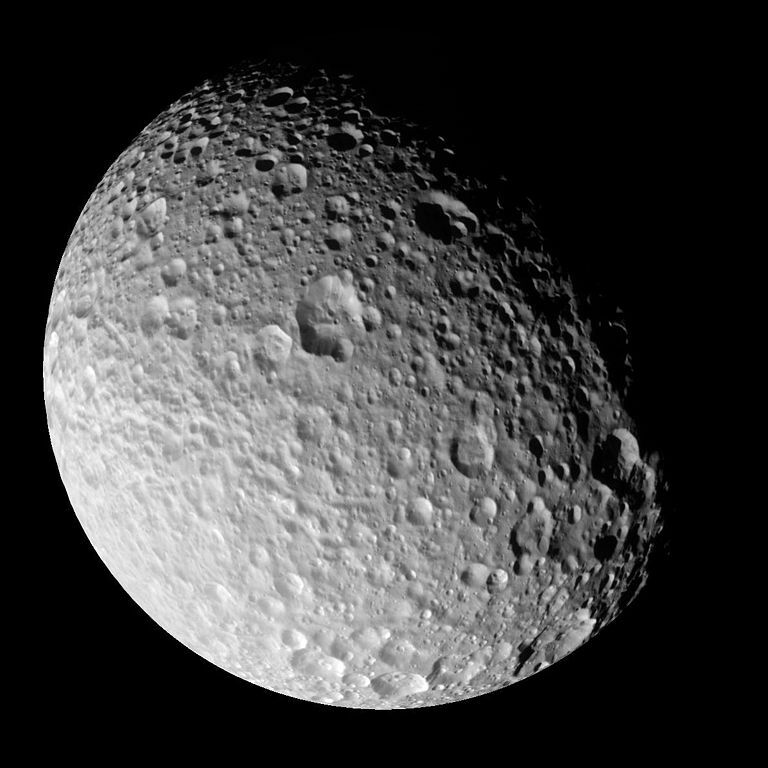 Like all but two of Saturn’s major moons, Mimas is ‘tidally locked’ to Saturn as it orbits; meaning the same face of Mimas always faces Saturn. This is similar to Earth’s Moon! 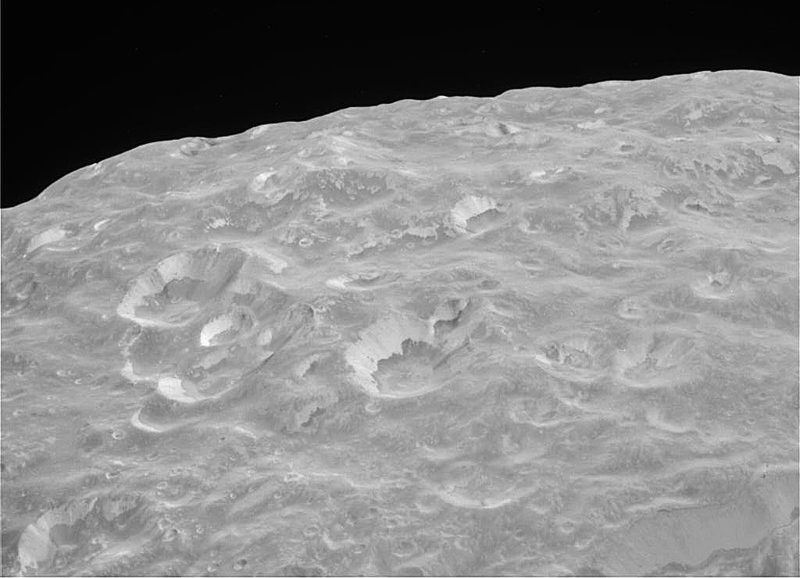 Mimas’ density is 1.15 times that of liquid water which suggests Mimas’ is composed mostly of water-ice and a small amount of rocky material! 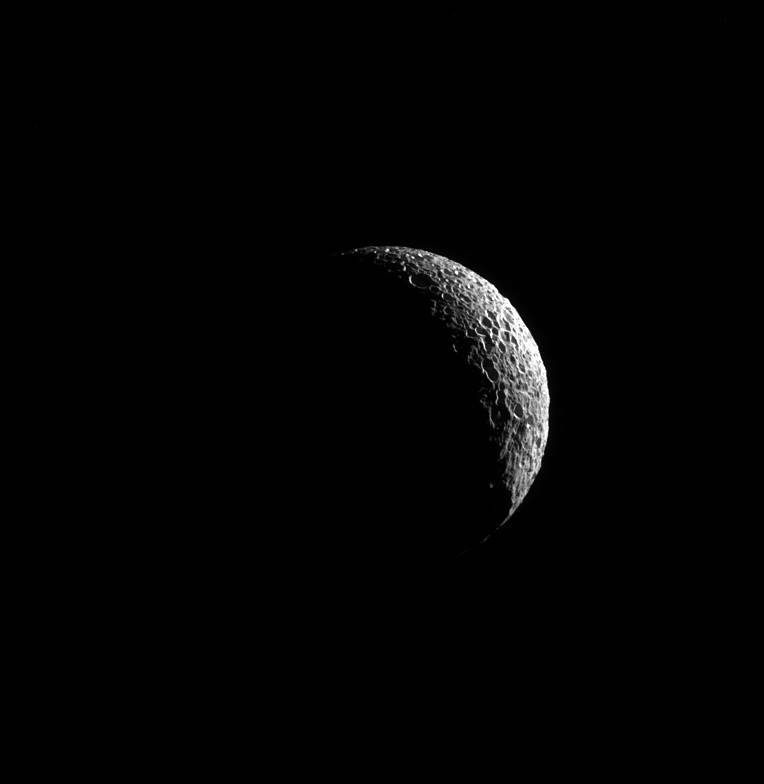 Mimas is locked in orbital resonance with the nearby inner moon Tethys, orbiting Saturn twice for every time Tethys does. 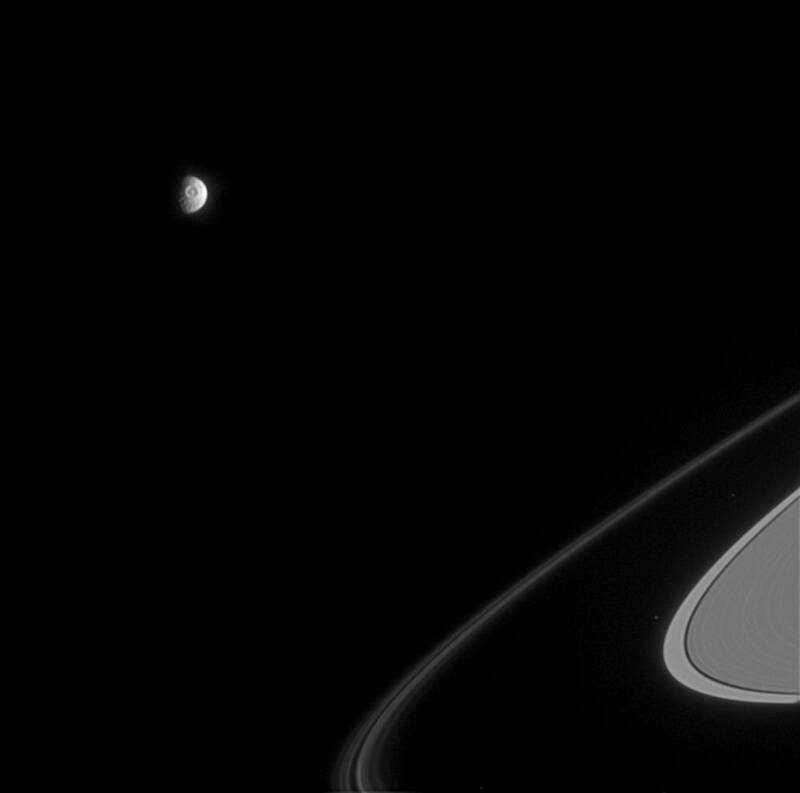 Mimas’ orbit is also in resonance with Dione and Enceladus while also perturbing Methone and several other small moons of Saturn. 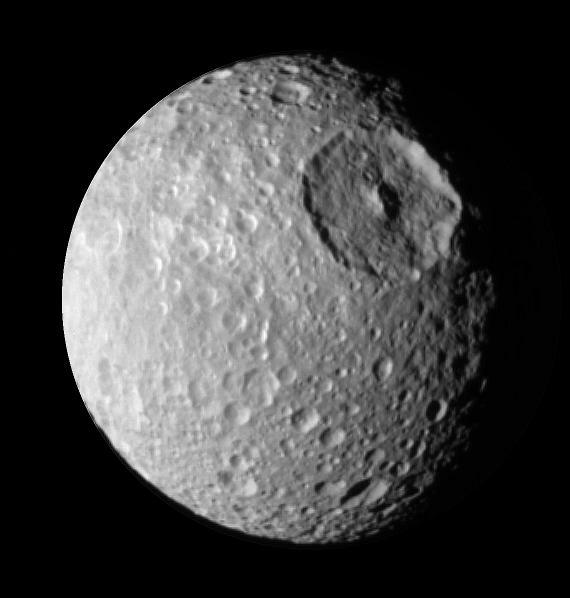 On account of Mimas' relatively small size, weak gravity and the tidal (and rotational forces) is not quite round, but somewhat ovoid. However, it’s the smallest object in the solar system to be gravitationally rounded (probably due to its water-ice composition and tidal heating)! 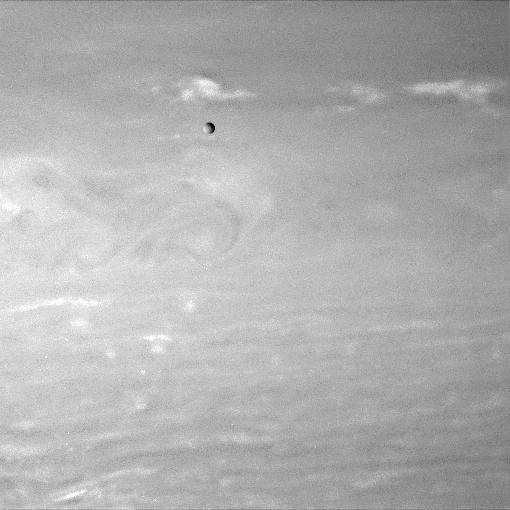 Images from the Cassini spacecraft revealed in more detail (than the Voyager 1 & 2 images) a heavily cratered surface ranging in size up to 40 km (25 miles). 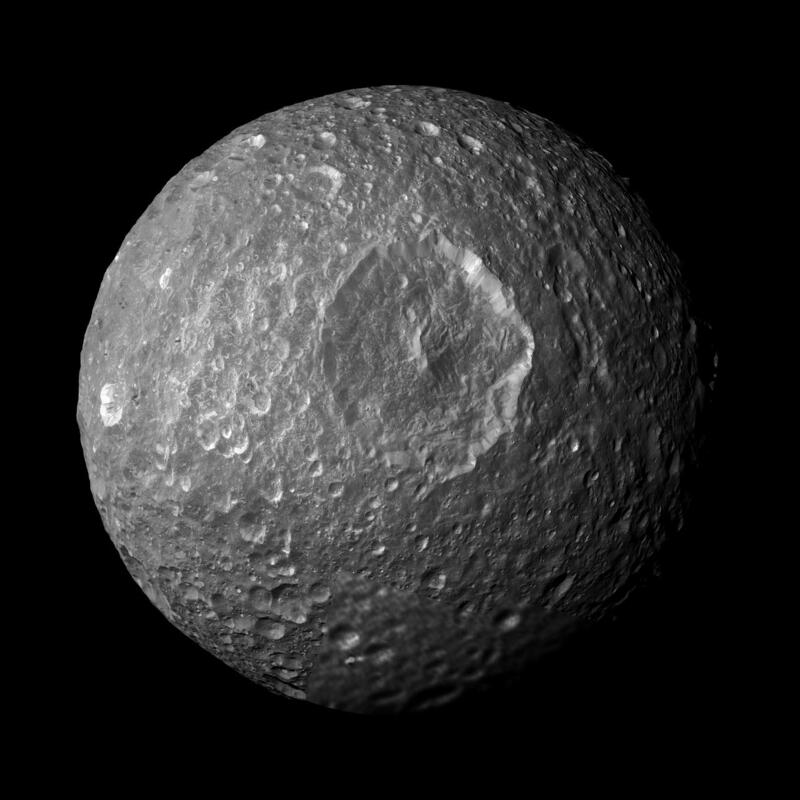 Of course, the major feature that dominates the cratered frozen geology of Mimas is the giant Herschel impact crater which stretches a 1/3 the diameter of the moon; making it look like the 'Death Star' from Star Wars! At 130 km (80 miles) across, the blast that created Herschel probably came close to breaking the moon apart! 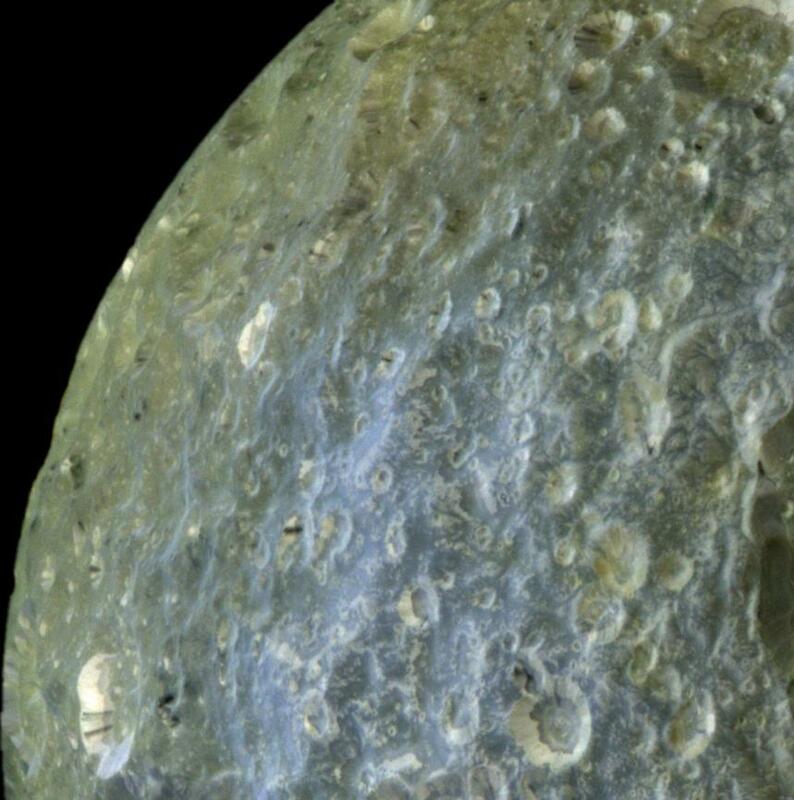 If Earth had a crater of similar proportion to Mimas’ Herschel Crater, it would be over 4,000 km wide – bigger than Australia! Check out Facts about Earth's craters here! 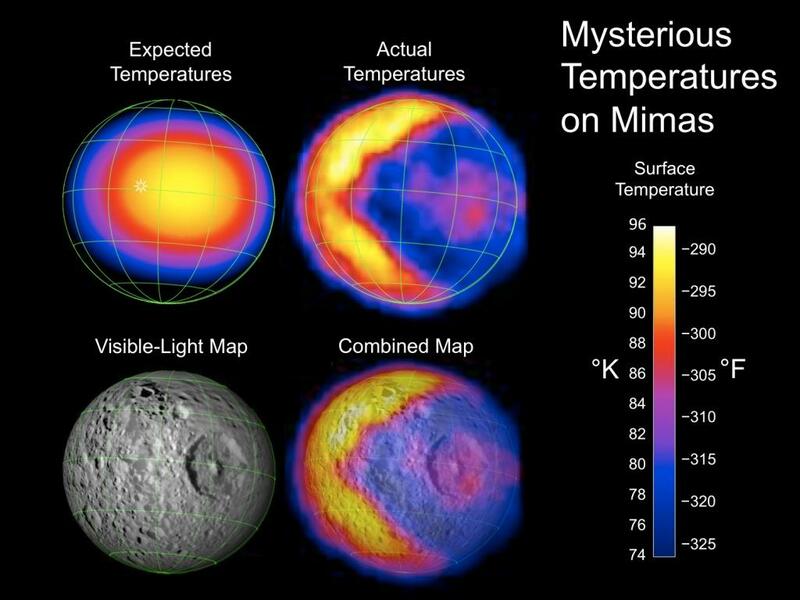 In 2010, NASA released a composite image of Mimas surface temperature based on data from the Cassini spacecraft which showed an uncanny resemblance to the PacMan character consuming a ‘dot’ represented by the Herschel Crater. A pretty funny coincidence! 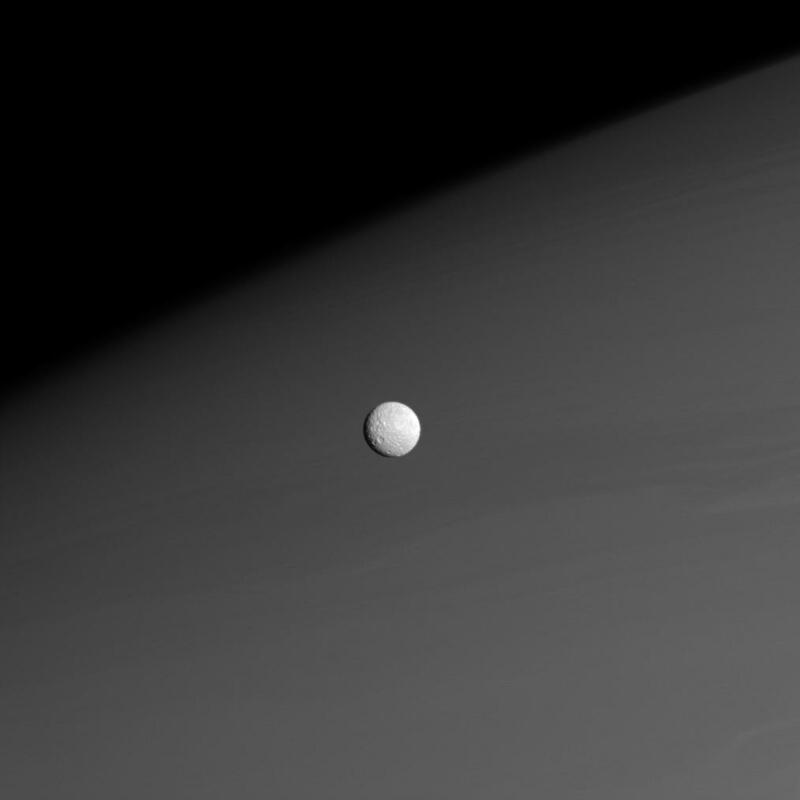 The fact that Mimas appears to be frozen solid is unexpected as Enceladus has a less eccentric orbit yet shows signs of significant tidal heating and geysers!